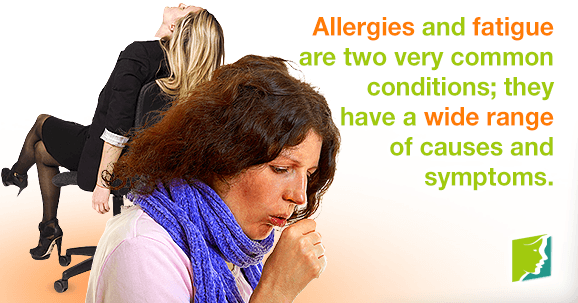 Allergies and fatigue are conditions that can co-occur, but can also be completely unconnected. The causes of each vary widely, so each person will have a different experience, but there are common patterns that are often seen. Read on to find out more information about allergies and fatigue and the most common complaints. Fatigue is a condition that is characterized by persistent exhaustion, and it often does not go away even with sleep or rest. Although it can be harmless, it can also be indicative of a serious medical condition, or even a reflection of lifestyle habits that need to be changed. For this reason, it is best to talk to your doctor if you notice fatigue manifesting itself in your life. There are many symptoms of fatigue, and they can vary in frequency and intensity depending on the person. Many of the symptoms are psychological, but there is also a large number of physical symptoms. The most common complaints are listed below. Finding the cause of allergies are more straightforward than fatigue, as each sufferer can normally pinpoint the direct reason for their particular type. They are medically defined as the immune system reacting to a foreign substance that does not cause a reaction in most people. Essentially, it is an overproduction of antibodies; normally created to fight of harmful invaders that could cause sickness or infection, the body identifies a safe substance as harmful, so it produces these antibodies, which can result in skin, sinus, or airway inflammation. Many people are allergic to things like pet hair, bee stings, and pollen. Because “allergies” is an umbrella term for an inappropriate reaction to any substance, the symptoms are not as easy to define as they are for fatigue. The allergy symptoms depend on the particular substance involved, and can affect many parts of the human body, including nasal passages, skin, and the digestive system. In some severe cases, allergy symptoms can be life-threatening, and sufferers of extreme allergies might have to take special care to avoid the aggressors or carry around specific medication. Allergies and fatigue are both very common conditions, and both have such a wide range of causes and so many associated symptoms that the particulars are often not easy to define. The symptoms above are the most commonly-associated side effects of allergies and fatigue, but this is by no means a complete list. Read more on how to avoid allergies. Read all about how to avoid unnecessary allergies during menopause here. Stop the coughing, sneezing, and itchy, watery eyes stops with these tips.